The 2013 NFL Combine is now in the books. We will give recaps of the top players at every position. Today we discuss running backs. While the emphasis has shifted to the passing game in the NFL, teams still need to be able to run the ball to keep the defense honest. Teams are now looking for running backs that can not only run the ball, but can be a threat in the passing game. If a back can only run the ball it’s easy for the defense to know what’s coming, but if he can catch the ball and more importantly protect the quarterback, then it opens up the entire playbook. Montee Ball-Wisconsin (5-10 214 lbs. ): Was in the running for the Heisman in 2011. Had an extremely productive year in 2012, but did not get the publicity. Rushed for over 1,800 yards and 22 TD in 2012. NCAA all-time leader in touchdowns with 83 touchdowns. Decisive one cut runner that would be a good fit in a zone scheme. Workhorse that likes to wear down a defense. Quicker than fast (4.66 40 yard dash). While he’s not extremely fast, he is the type of back that gets better in the 4th quarter when the defense gets tired. Kenjon Barner-Oregon (5-9 196 lbs. ): One of more explosive players in the draft. What makes him special is his ability to cut while at full speed. Exceptional burst and acceleration. Very quick feet but not as fast as you would expect (4.52 40 yard dash). 35.5” vertical jump (tied for #5 in RB group). 6.87 3 cone drill (tied for 5th best RB). Very good receiver out of the backfield. Had a good workout. Le’Veon Bell-Michigan State (6-1 230 lbs. ): Big back with surprising athleticism. Powerful lower body. Lighter on his feet that you would expect. Runs with good pad level and has good second effort. Runs well in traffic and has the ability to squeeze out a few extra yards. 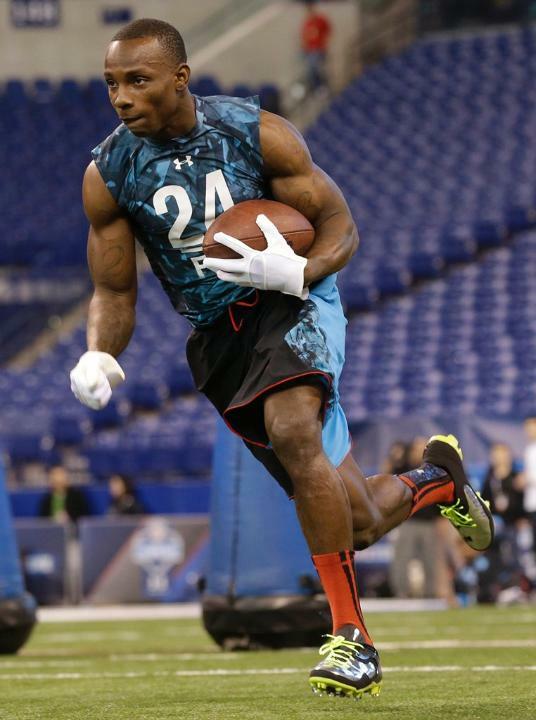 Bench pressed 24 reps. Showed his athleticism in the 3 cone drill with the third best time of the running backs (6.75). Giovani Bernard-North Carolina (5-8 202 lbs. ): Shifty back with good burst. Has a nice jump cut move. Very quick in the hole. Has some wiggle to his running style. Only ran a 4.53 40 yard dash. Tied for 3rd best short shuttle among running backs (4.12). Impressive workout. Tommy Bohanon-Wake Forest (6-1 246 lbs. ): Fullback with good strength. 36 bench press reps was the best among running backs. Has good hands. Zach Boren-Ohio State (5-11 238 lbs. ): Fullback that is a punishing lead blocker. Also able to line up as an H-Back. Good lower body strength. 25 reps on the bench press. Gives big effort. Sold out for a catch during on-field drills. Knile Davis-Arkansas (5-10 227 lbs. ): Good combination of size and speed. Led the SEC in rushing in 2010. Broke an ankle in 2011. Took him most of 2012 to recover. Ran the 2nd fastest 40 for running backs (4.37). Bench pressed 31 reps. Had some issues with fumbles. Will he be able to stand up to the pounding in the NFL? Looked impressive in on-field drills and likely improved his draft stock. Andre Ellington-Clemson (5-9 199 lbs. ): Runs with great balance. Ran a slow 40 time (4.61), but he looks faster on tape. For a back his size, he should have run faster. Johnathan Franklin-UCLA (5-10 205 lbs. ): One of the more well-rounded backs in this year’s draft. Runs with good patience. Runs nice routes out of the backfield and has good hands. Protects the quarterback extremely well in pass protection. Able to make cuts without losing speed, Ran well (4.49 40 yard dash). Looked good in the Senior Bowl and had a very good Combine workout. Is steadily rising up the draft charts. Onterio McCalebb-Auburn (5-10 168 lbs. ): Small and lean body, but extremely fast. Had the fastest 40 among the running backs (4.34). Was the Florida high school 100M champ his senior year. Is able to return kicks. Is he big enough to hold up? Definitely opened a few eyes and teams will be digging deeper into his game tape. Christine Michael-Texas A&M (5-10 220 lbs. ): Very physically gifted. Had a disappointing college career. Had a couple of injuries but was also benched last year. Seems to be a bit immature and needs to grow up. Had very good measureables and was smooth in the on-field drills. 4.54 40 yard dash, 27 bench press reps (tied for 4th best RB), best vertical jump for running backs (43”), 10’5” broad jump (tied for 2nd best RB), best 3 cone for RB (6.69), best RB short shuttle (4.02). Stepfan Taylor-Stanford (5-9 214 lbs. ): Underrated back that did not run a great 40 yard dash (4.76). Did not do well in the on-field drills also. In an era where athletes train exclusively for the Combine, he looked unprepared. Kerwynn Williams-Utah State (5-8 195 lbs. ): His 4.48 40 yard dash was 3rd among RB and his 4.15 short shuttle was 5th best. Able to play in 5 wide packages and find soft spots like a wide receiver. Short and stout. Willing to run between the tackles. Has great lateral movement and acceleration. Changes direction without losing speed. Has good moves and is always seems to get positive yardage. Good on screens and is dangerous in space. Struggles in pass protection. Cierre Wood-Notre Dame (5-11 213 lbs. ): Ran a 4.56 40 yard dash which is good for his size. Has good quickness. Willing to run it between the tackles. Has good hands and catches the ball well. His 37.5” vertical jump was 5th best for running backs and his 10’ 4” broad jump was 4th best. He improved his draft status with this workout. This entry was posted on March 5, 2013 by draftmaniacs in All-Star Games and Combine, Scouting reports and tagged 2013 NFL Combine, 2013 NFL Draft, andre ellington, arkansas football, auburn football, cierre wood, Clemson Football, johnathan franklin, kerwynn williams, knile davis, NFL, NFL Draft, Notre Dame football, onterio mccalebb, UCLA football, utah state football.